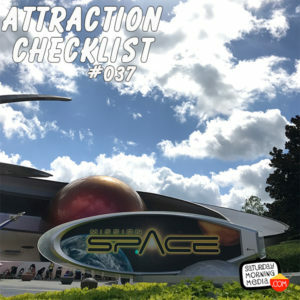 http://www.attractionchecklist.com – John B. deHaas and I head to EPCOT to experience the, newly opened, green mission on RELAUNCHED! Mission: SPACE! First, we learn a little about the ride, then we ride and review this revamped attraction. Recorded on August 13, 2017. This episode we head to EPCOT in Walt Disney World to ride the newly opened RELAUNCHED! Mission: SPACE! Today we’ll be experiencing the Green, less intense, version of the attraction that’s been dubbed Mission:Earth. The guide map describes this attraction by saying Experience NASA-style training with a simulated space launch. The Green Mission of the relaunched Mission: SPACE has a height requirement of 40” and expectant mothers should not ride. Fastness Plus is available for this attraction. The thrill level describes the ride as being a Spinning, Thrill Ride in the Dark, though the Green Mission does not spin. Before we are go for launch, here are five fast facts about the green Mission of Epcot’s Relaunched! Mission: SPACE. 1. Mission: SPACE had it’s Grand Opening on October 9, 2003 though it went through a soft opening in the months before. When it opened there was only one side experience. It wasn’t until May of 2006 that the less intense, non-spinning Green Mission was open giving riders two ride options. 2. At 2017’s D23 Expo, it was announced that Green Mission would be getting its own unique ride video, dubbed Mission: Earth that would debut on August 13, 2017, the date the audio for this episode was recorded. 3. When the Relaunched! Mission: SPACE opened in August of 2017, actor Gary Sinese, who’d been the ride’s CapCom had been replaced by actress Gina Torres. 4. The new Green Mission still gives rider assignments for the trip of Navigator, Pilot, Commander or Engineer and each rider has the opportunity to push buttons at various points on the trip. If the riders do not push the button in time, a storyline ‘computer override’ will occur. 5. While on the Green Mission, riders see simulated views of Earth from space including The Grand Canyon, The Hawaiian Islands, The Great Wall of China and more. All these visuals are accompanied by a brand new musical score for the ride. Now let’s head to EPCOT to ride the Relaunched! Mission: SPACE Green Mission. Along for the ride is John B. dehaas and after the ride audio we’ll discuss our thoughts on this update to Mission: Space. Also, to cut down on the episode length, some of the waiting time between ride announcements has been edited out. This is a binaural recording so if you have headphones put them on now as we ride the Green Mission of Relaunched! Mission: SPACE at EPCOT in Walt Disney World!